All About Sports Cards: Play Madden NFL 12 Now, WIn A Car Later. Free Demo Is Live. Play Madden NFL 12 Now, WIn A Car Later. Free Demo Is Live. The NFL Lockout is over... joy. The first NFL preseaon game is two days away... double joy. 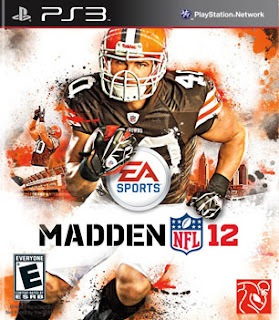 You can play Madden NFL 12 on your XBox 360 or PS3 today... WHAT!!! Yes, Madden NFL 12 hits store shelves on August 30th, but the free demo version of Madden NFL 12 became available for download this morning on Xbox and PlayStation. Here is the kicker. Electronic Arts will give a new Chevy Cruze to a lucky player who masters the demo. So you can play Madden now for free and potentially win a car... JOY, JOY, JOY. Along with playing the game and having the chance to win a car, the demo lets you watch videos and learn new elements of the game. The videos feature Van Bernardino, who goes by the name “Prodigy” and is known in gaming circles for being a champion Madden NFL videogame player and Reggie Bush. To have a chance at winning the car, all you have to do is play the demo, call an audible on offense and score a touchdown on that play. A special code will be revealed that can be entered on the Madden NFL 12 Facebook fan page for a chance to win the 2011 Chevy Cruze. So get your Madden on now. You have until Sept. 30th to enter the contest. Sorry residents of Florida and New York, you are not eligible. I have no idea why, that's just the way it is. I don't make the rules, not my contest.